04/06 - Start Racing Now! 03/29 - KTM Dukehana and Shell Advance Super Series Opening this Weekend! 03/19 - Don’t Miss these Promos from Motortrade and See them at the Thirteenth IR Bike Fest! 02/16 - Suzuki Scooter owner ka ba? Need to know this! 02/12 - Spark Plug Caps are also IMPORTANT! 02/05 - Team Pilipinas UMA Racing- Yamaha Phils. Launched in Sepang! 12/19 - KAWASAKI Dominar 400: Can Anyone Even Come Close? 11/25 - Inguito, Paz, Fernando, Mauricio, Barcial, Chang and Suba Pole Position Winners in IRGPXII! 11/20 - New Fuel Efficiency Record for the Yamaha Sight Underbone Set by Onahon! 11/18 - Alberto achieves first Moto3 Pinoy Podium! 11/16 - Suzuki Philippines and Team Suzuki-VMan Racing Celebrates Victory! 11/10 - Triple Double for FDR in the 2018 Shell Advance SuperSeries! 11/04 - Marquez penalized. Dovi will start from 5th. 10/01 - KTM BGC celebrates 2nd anniv! 09/24 - Motostrada’s flagship showroom is now officially open! 09/15 - IR News: Yamaha GP 9 Finals in Palawan – Who Were Victorious? 09/09 - What Masato did 7 days after a big crash! 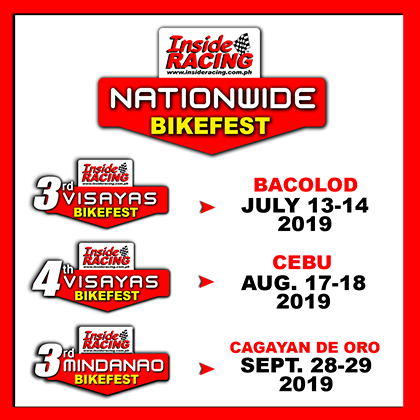 08/31 - 2nd InsideRACING Visayas Bikefest in Cebu! 08/31 - IR News: Back-to-Back Super Scooter Win for Dan Carlos! 07/07 - KAWASAKI MOTORS PHILIPPINES CORPORATION CELEBRATES ITS 50TH ANNIVERSARY! 05/24 - Experience the IR 2nd Mindanao Bike Fest for Free this May 26-27 in Davao! 04/29 - Wheeltek GP 5 Set at the Carmona Race Track on May 6! 02/20 - 1st IR Dirt Challenge presented by Petron @ the IR Dirt Fest! 02/01 - The biggest Suzuki Raider R150 Summit yet! 01/26 - IR News: TJ Alberto Returns to CIV and is the First Filipino to Race in WSBK! 12/09 - Honda Big Bikes are finally here in the Philippines! 11/15 - IR brings the MAGIC to Mindanao with 1st ever IR Mindanao Bikefest! 11/06 - Ducati’s new Panigale V4! 10/27 - IR MotoGP Update: Dovizioso tops the first day of the Shell Malaysia Grand Prix at Sepang. 10/25 - IR News: BMW G 310 GS – the Smallest Member of the Family Has the BMW GS Genes! 10/06 - The All-new Yamaha YZF-R6 Refined. Redesigned. Remarkable. 09/07 - IR News: Filipinos Shine in Vietnam! 09/06 - Dainese opens shop in Ortigas! 08/29 - IR News: It’s Great to Be Eight for Motorsiklo Xklusibo! 08/24 - IR News: “The Chairman” Reigns in Super Scooter for the Third Time! 08/17 - IR News: Suzuki Philippines Full Force with the Raider R150 FI, GSX-R150 and GSX-S150! 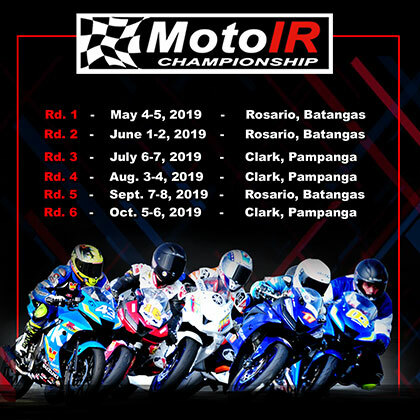 07/13 - IR News: BMW Motorrad Philippines’ Mangulabnan Repeats Victory! 07/11 - IR News: Bikeworld-Suzuki 3S Shop in Santa Rosa Now Bigger and Better to Serve You! 06/24 - Blu is Really Fast!!! 06/22 - IR News: Margin of Victory in Super Scooter Race was Only 0.001s! 06/22 - IR News: The “Dustroyer” Breaks Away! 06/19 - The much awaited All New Yamaha YZF-R15 is finally here! 06/17 - IR News: DES Marketing Now Has a Suzuki 3S Shop in Iloilo! 06/09 - IR News: KAMMI Inaugurated; The Philippines Now Manufactures KTM Motorcycles! 05/11 - ALL NEW Suzuki GSXR-1000R – Own the race track. 05/04 - IR News: 2017 Ducati Cup kicks off. Excellent debut for Panlilio while Defensor off to a great start in Expert class. 04/12 - IR News: Mauricio Wins Super Suzuki Race by 0.001 Second! 04/07 - The Suzuki Hub Brought Together Thousands at the 11th IR Bike Fest! 04/04 - IR News: Shell Advance IR Track Day is Back! 04/04 - IR News: Shell Advance Super Series Nationwide Championships Starts on April 9 in Clark! 04/03 - IR News: Perfect Score for Team Suzuki Pilipinas in Johor! Borbon Jr. and Mascardo Victorious! 04/03 - IR News: Perfect Score for Team Suzuki Pilipinas in Johor! Borbon Jr. and Mascardo Victorious in SAC! 04/03 - Yamaha Moto Gymkhana kicks off! 03/02 - Honda’s “Ride the Ultimate” Gen-S scooter unveiled at the Scooterfest! 03/01 - Castrol Power 1 Nationwide Flat Track Series: Luzon Divisional and Nationwide Championship riders gear up for the final races; Sam Tamayo leads Premier Class. 02/21 - Maximum Torque ADV Challenge successfully wraps up first installment, inaugural champs named. 02/20 - Kawasaki Roadgasmic Party – the Beasts unleashed! 01/29 - All set for the KTM Orange Day Tour 2017! 01/11 - IMC XII: Are you ready for the most challenging Ironman yet? 12/13 - Wheeltek Track Day 3 a huge success! 12/04 - All new Honda BeAT unveiled! 12/04 - IR News: Philippines’ Borbon Victorious in Thailand! 10/30 - “Suzuki offered more money” Shell Ducati Sporting Director Paolo Ciabatti. 10/24 - KTM Makati is now Ready to Race! 10/06 - IR News: BMW Motorrad-HGM’s Mangulabnan 2016 Pirelli PSBK Expert Class Champion and Rider of the Year! 10/06 - IR Update: Masato Fernando wins 2nd Underbone King title; Ellijah Olayvar and James Barcial are season champs. 09/26 - IR Update: Super Underbone in Cebu Dominated by Garry Cañeda Jr.
09/25 - The much awaited Yamaha TFX is finally here – The Fierce Xperience! 09/09 - Torque Flat Track series – exciting night time race thrills crowd! 08/26 - Shell Advance IR Cup Rd. 2 160cc Automatic – Mckinley wins battle of Elite riders; Mauricio shines! 08/25 - IR Update: MotoIR Round 3 – The Dustroyer Wins! 07/24 - Diavel Day 2016 – BDDP Continues to Roar this 2016! 07/06 - 2016 BMW Motorrad Days: Another Huge Success! 06/04 - IR Update : Sobretodo and Borbon makes it a Pilipinas 1-2 finish in Japan! 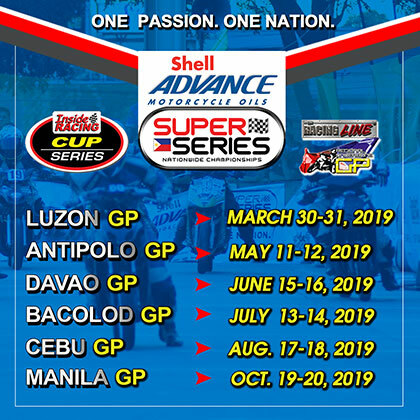 05/18 - All is Set For the Pampanga GP of the Shell Advance Super Series and the First Round of the IR Cup and MotoIR! 05/17 - Ayala’s Adventure Cycle Philippines, Inc. and KTM partnership formally introduced. BGC flagship store to be up in July. 05/07 - Suzuki Asian Challenge: Mascardo podiums in Buriram! 04/08 - 10TH IRBFTS: The Big One! 02/24 - IR Update: IRBFTSX on Apr 2-3 gathers record number of exhibitors! 12/28 - IR News: 114 BMW R 1200 GS motorcycles set sail for Thailand and the BMW Motorrad International GS Trophy 2016. 11/17 - The much awaited Honda RS 150 and CB150R both revealed at IRGP9! 10/30 - SUZUKI TRIPLE THREAT LAUNCH HELD IN 35 AREAS NATIONWIDE! 09/29 - All new Honda Zoomer X revealed at the Gen S Scooterfest! 09/23 - SUZUKI wins Endurance World Championship! 08/04 - CONTENTION FOR MOTOIR2 AND SAMYC TITLES HEATS UP! 06/25 - 2015 SHELL ADVANCE IR CUP KICKS OFF! 05/20 - SAVE KIDS LIVES! 04/25 - BMW Motorrad reignites motorsports with first ever PH racing team. 04/16 - TEAM SUZUKI PILIPINAS ALL SET FOR THE SUZUKI ASIAN CHALLENGE AT THE ARRC! 04/07 - Official Launch of the first KTM Flagship store in the Philippines! 04/01 - Filipino rider Tadachi tops Days 1 of Asia Dream Cup Sepang Test. 03/27 - Kawasaki Roadgasmic Road tour 2015 kicks off! 01/21 - MotoMarket Alabang Has Opened Its Doors This January! 01/15 - IR rides the new Yamaha Tricity! 10/29 - Philippines’ Paz joins 2015 Shell Asia Talent Cup, Mendez on reserve list! 10/26 - Toba wins Shell Advance Asia Talent Cup Championships. Torres finishes the season. 10/08 - Torres wins and Lopez is the new 2014 MotoIR Champion! 09/18 - Rivero, Baguasan And Villanueva Hailed As IR Backbone Champions at Shell V Power event. 09/04 - Globe Slipstream event featured Ducati Superbikers and Panigale SL at BGC. 08/22 - Insideracing.com.ph – MAURICIO and RAMOS OFF TO SEPANG for SHELL ASIA TALENT CUP SELECTION! 08/22 - Insideracing.com.ph – KAWASAKI, LAZARO and BAGUASAN star in IR BACKBONE RACE! RIVERO FASTEST! 08/22 - Insideracing.com.ph – ESGUERRA, SUBA, PAZ and INGUITO are 2014 IR CUP SERIES CHAMPIONS! 08/16 - insideracing.com.ph -WHEELTEK 40th Year Celebrations starts! 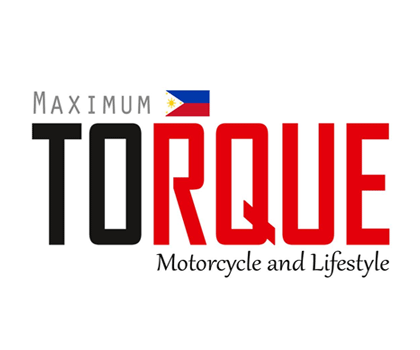 08/16 - insideracing.com.ph – New Motorstar 250cc Adventure bike coming! 07/15 - Doblada wins MotoIR at Carmona! 11/28 - IRGP7 MAKES HISTORY! 09/27 - IRGP 7 Live! 11/19 - A New Record of 105 entries for the 6th Motolite InsideRACING Grand Prix! 10/20 - IRGP6: A New Chapter Begins! 10/05 - USRA Events Oct.
09/25 - MotoIR Race 3 Video Highlights. 11/11 - A record 104 race entries for IRGP5! 11/24 - FIM Asia Continental Supercross Final Round Philippines! 08/27 - Aug 16 – MotoGP, Brno Czech Rep.
08/27 - July 26 – WSBK, Brno Czech rep.
07/06 - InsideRacing Track Days are Back! 05/05 - May 05 ’09 : Stewart 2009 AMA and FIM SX Champion! 01/19 - Jan 17 : Dominant Year for Kawasaki in the Phils. 01/12 - First IR-SUZUKI Track day a success! 01/12 - IRGP2 draws record crowd! 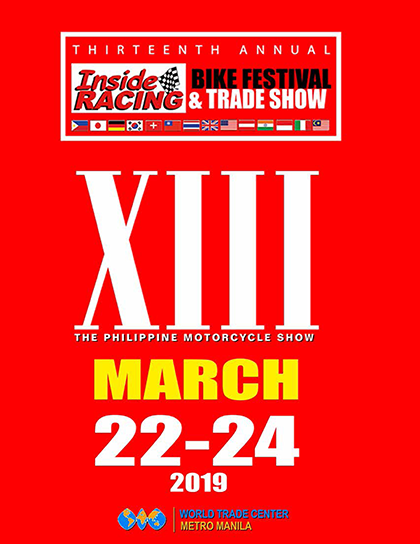 02/27 - Feb 27 : Fifty four (54) Exhibitors Confirmed for the 2nd IR Bikefest!